I love her, and we get along fine. Better than fine, frequently. We make each other laugh, and we’re on the same side more often than not. She adores my daughter and treats her like royalty, like Emerson is here to do something very important and my mother’s job is to nurture her until she fulfills her destiny. And that fills me with tenderness. Even so. my mother annoys me. Which is an improvement, because she used to drive me to the acidic, smoking, volcanic glass edges of shrieking rage. But after 10+ years of therapy that in large part involved dissecting, pinning open, labeling, cataloging, and filing away everything dark between us — from the queasy vibrating terrors of paradigm altering betrayal to petty hurt feelings — I can say with utter honesty that I love her dearly, and she annoys me. I’ve also come to realize that, when it truly mattered, she gave me what I needed most. 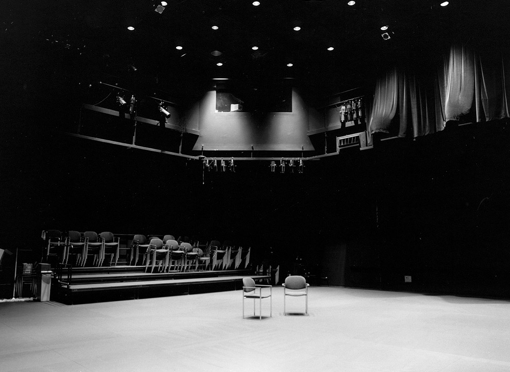 I didn’t end up making a life in the theatre, but my education gave me the ability to stand in an empty black room and create worlds. It taught me the rhythm and sensuality of language, the craft of story. It taught me how to swallow my fear, stand up in front of strangers, and persuade them to follow me into laughter or terror or grief. It gave me a bright, clear voice, and the ability to drop or recall my New York accent at will. It taught me that evil can be charming, that goodness can be complicated, that love is sometimes a dagger plunged into your beloved’s heart. It taught me how to think on my feet, how to be in the moment. It taught me how to concept, how to improvise, how to riff an idea with a partner like we’re playing jazz. It gave me a lexicon of private jokes, which make musical parodies and movies about show business infinitely funnier to me than they are to civilians (that’s what theatre people call non-theatre people, and I’m still delighted to be counted in the club, however marginally). It gave me a home, where passion and a black turtleneck were the only price of entry, and everyone valued my broken places and moody sadness. It gave me a safe place to be, until I could make the world safe for myself. And the reason I was able to pass into this state of grace? To spend my days reading Greek myth and Shakespeare, my nights playing onstage with friends I loved so much they still feel like long-lost family. To wrestle with ancient passions, and pain, and elemental comedy. To be part of something so much larger, so much brighter, so much more complete, so much BETTER than I could imagine real life could be. Something I needed, craved, more than food, more than air, more than love. Because my mother let me major in theatre. When I was in college, I knew so many people who were majoring in English, in Communications, not because this was what they wanted or cared about, but because their parents wouldn’t allow them to major in theatre. Because their parents threatened to pull their tuition if they did. As an adult, I have met 50-year-olds who still wistfully look back on those days and wish they could have been braver, could have declared that theatre major, declared themselves. But not me. I have my regrets, but they are all of my own making. Because my mother not only allowed me to declare a theatre major, she encouraged it. Encouraged me to run with it, as far as I could. To lie on that floor and SMELL THAT ORANGE like no one had ever smelled an orange before. And more. She took me to see Malkovich in “Burn This,” to countless musicals, to the opera, to the ballet. She paid for Saturday theatre school in Manhattan, for performing arts camp. She came to every show, even if she had to drive 4 hours to see me play farmer’s daughter #6 in “Oklahoma.” She joyfully made space in our living room for the “Godspell” set, for the elephant we made for “Barnum.” She welcomed home an endless cast of romantic boys and dramatic girls, all invited to stay as long as they needed to and eat all the American Cheese in the refrigerator, provided they called their mothers first and got permission. My mother annoys me. In a flash, she can slip a thin silver knife under my skin and make me bleed, just with an offhand remark. And I know I hurt her too. That she craves more closeness with me, and I can be selfish and withholding with my affection. That I struggle to forgive what she believes should be forgotten. But when it mattered. When it truly mattered, she gave me everything I needed. And then some. And that is where I’m bringing the curtain down on this one.